Ask anyone what the worst part is about going to the doctor, and they will often answer: “getting a shot.” The needle and syringe have been the primary medication delivery method since the 1850s, with little groundbreaking technological change over the last century and a half. Patients with chronic conditions who must receive frequent, sometimes even daily, injections are all too familiar with the sting and the inherent anxiety of handling needles. There have been previous attempts to innovate needle-free injectors, but their noise, inability to handle large medication volumes, and pain made them unattractive alternatives to the traditional syringe. All of that is about to change with the introduction of an innovative needle-free jet injection platform from Portal Instruments. Portal Instruments was founded 4 years ago in Cambridge, Massachusetts, to further develop and commercialize a new needle-free jet injection platform. 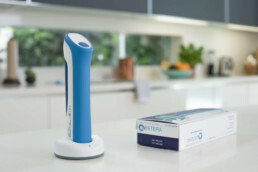 Originally developed in Ian Hunter’s lab, the Portal device is the only closed-loop feedback controlled needle-free drug delivery device available. It can administer up to 1 mL of medication, whereas similar legacy devices could only deliver 0.2 to 0.5 mL. In addition, the technology is quiet, fast, and agnostic to both viscosity and temperature of the medication. Historically, needle-free devices used a mechanical means (e.g. a high-powered spring, compressed air or gas cartridges like CO2 or Nitrogen) to generate, essentially, an “explosion” to inject the shot. Unfortunately, it also sounded like an “explosion” and left patients feeling like they got punched. The Portal system, in contrast, uses a computer-controlled linear actuator that pressurizes the medication and injects it in a very fine jet, about the size of a strand of hair. The entire injection takes less than half a second. The algorithms within the device allow for injections at a specific depth within tissue, and the release of medication is precisely controlled during the injection process – fast at first and then slow. The breakthrough in needle-free injection technology is a win for sufferers of chronic conditions who rely on injectable drugs or biologics for treatment. Current needle-based syringes are tedious to use and require a lot of attention to detail, especially if the needle must be inserted for a prolonged time to administer the complete dose. Portal Instruments’ next generation needle-free platform provides a better experience, putting patients at ease. Additionally, the device is expected to increase treatment adherence rates, which is currently estimated to be only 40% to 70% depending upon indications. Pharmaceutical firms looking to differentiate their biologic medications and improve patient comfort have a new tool at their disposal in Portal Instruments’ needle-free jet injection platform. The connected device can track treatments and remind patients when it’s time for injection. The platform also has the potential to aggregate anonymized patient data on adherence, which can offer useful insights into treatments across a population set. To learn more about improving adherence rates and transforming the patient experience through needle-free technology, get in touch with us at info@portalinstruments.com.